Let’s jump in the water! 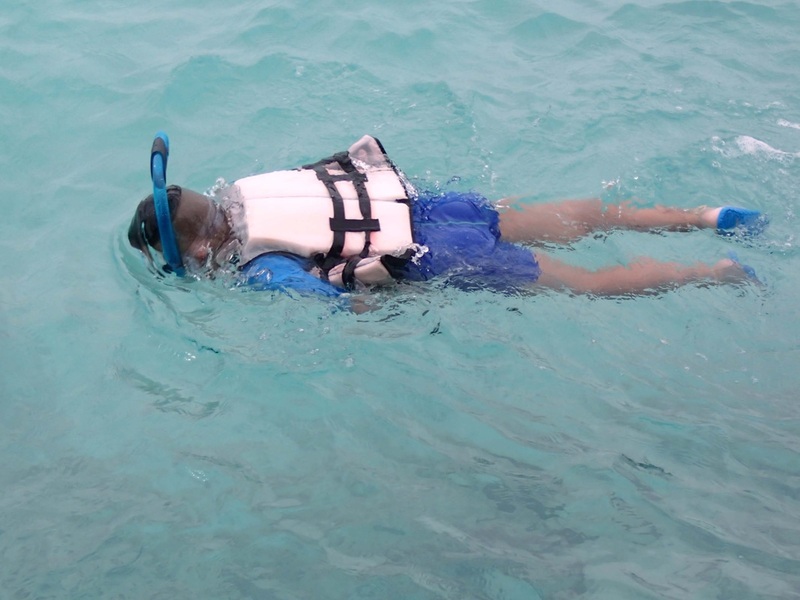 Snorkelling is the easiest way to explore colorful fish and corals. It is a benefit that you can swim, but the salt sea water provides plenty of buoyancy. My BMI is 28, and I need to carry 2 kg lead and empty my lungs before I start sinking. You can rent a floating vest if you want to be 100 % sure not to sink. Essential equipment is mask and snorkel. Fins are recommended, as they provide efficient propulsion. Many lagoons are not deep, so it is possible to stand up, take a breath and adjust the equipment. It is not recommend to step on the reefs, as the corals are fragile and sharp. And if you have bad luck, you may step on a Scorpionfish. What can you see? Just outside the beach are there several fish species searching the sandy bottom for something to eat, for example Goatfishes, Mullets, Silverbiddies and baby Sharks (but don’t worry - they more are scared of you than you can imagine). Then we have the jetties and the water bungalows. Many fish species thrives along the pillars, which are covered by plants. Examples are Humbugs, Sergeants and Wrasses. In the lagoons can you see some dark areas. Here will you find coral covered rocks and finger corals, which are home for Butterflyfishes, Damselfishes, Groupers, Parrotfishes, Surgeonfishes, Wrasses and Triggerfishes, just to mention a few of them. The reefs provide colorful corals and more variety of fish species, including attractions like Turtles, Manta Rays and Whale Sharks. Boat trips to such places are arranged on regular basis by the resorts. Below are some pictures taken during snorkeling at shallow depths. 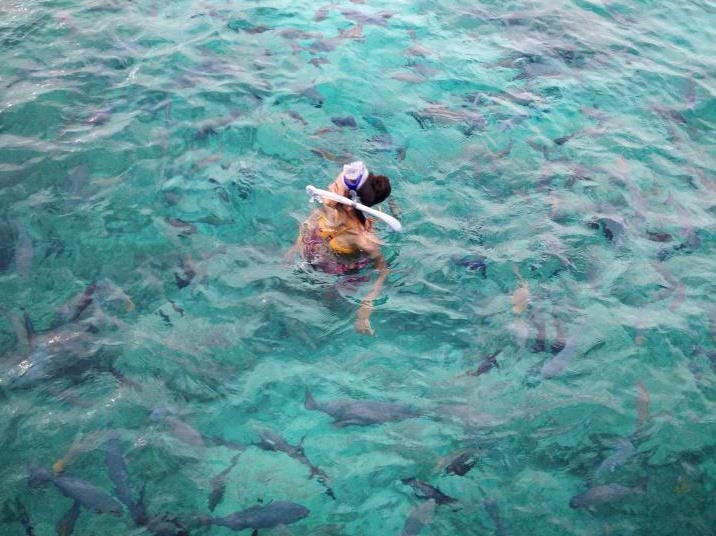 A snorkeler surrounded by Rudderfishes. They are waiting for pizza dough from a restaurant nearby. 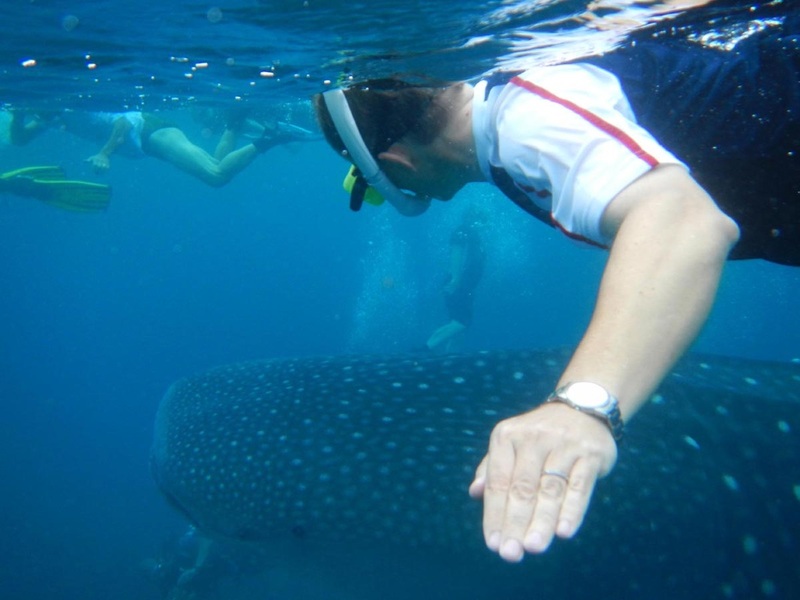 This is me snorkeling with a large whale shark. It was a fantastic experience, and it prompted be to start scuba diving.